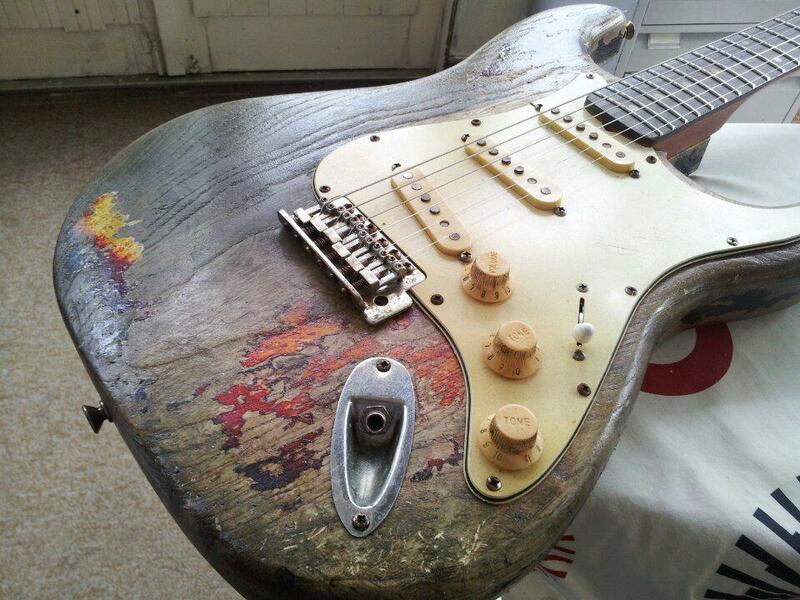 A Mr. Paul Byrne kindly stopped by our FB page to share some pics of his own DIY Rory Gallagher creation. 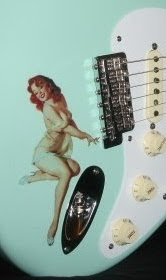 And I must say that I dig the vibe of Paul's Rory Strat over the Fender CS Tribute models. 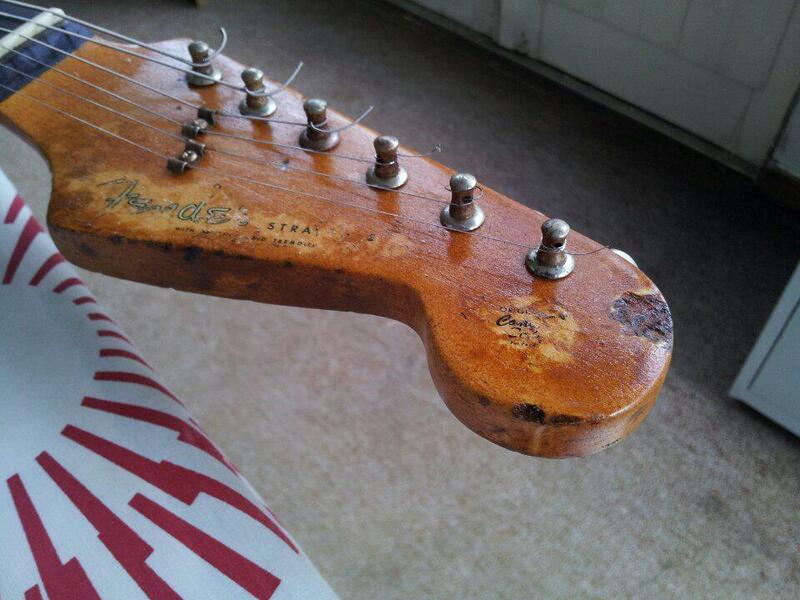 This Strat really looks like it has stories of years on the road and nights in soggy Irish pubs between tours. 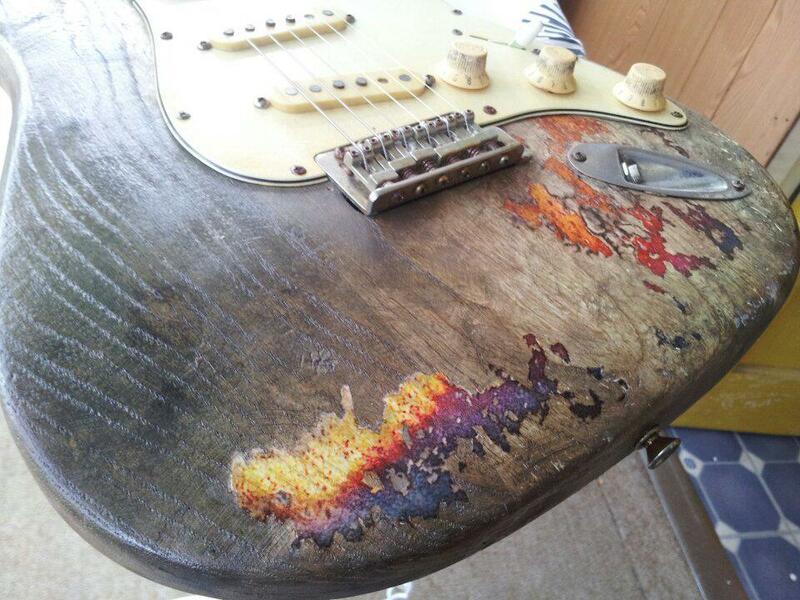 Notice that the finish-less areas aren't simply stained bare wood, like any standard "dry"relic job. Instead, there's gunk and crud build-up with a friggin' greenish hue about it too! Aye! And Lads, will ya just look at the end of that headstock with a chunk missing! You can bet that happened over a bonny lass! Aye, ya can! Yeah, I can smell this guitar through the photos. Like sittin' in an old, dark wood booth with Rory himself, Van Morrison, Phil Lynott and Gary Moore-- tucking into a bottle of Jameson and glasses of Guinness around a big full ashtray on one dank, bone chilling, foggy evening it be. And me, but a wee fly on the malt vinegar bottle... "Hhhhelp meee!" Obviously, an SRV Strat wasn't enough challenge for the good Mr. Byrne, who wanted to express the true test of a man's liver! So drink a toast to Paul for a job well done! And now if you'll excuse me, I'll be off for a taste of some Irish Tour '74.